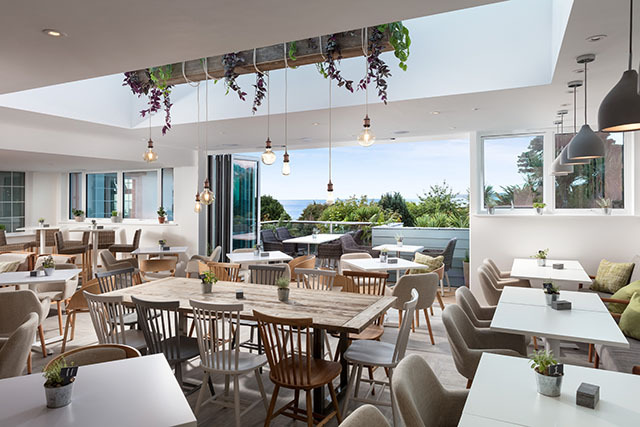 St Michaels Resort in Falmouth has recently undergone a huge renovation, a £20million refurb to be exact. The hotel now boasts an enormous leisure club, 32 swanky new suites and bedrooms (bringing the total to 84), a beautiful spa, and two new-look restaurants, The Brasserie on the Bay and The Garden Kitchen. 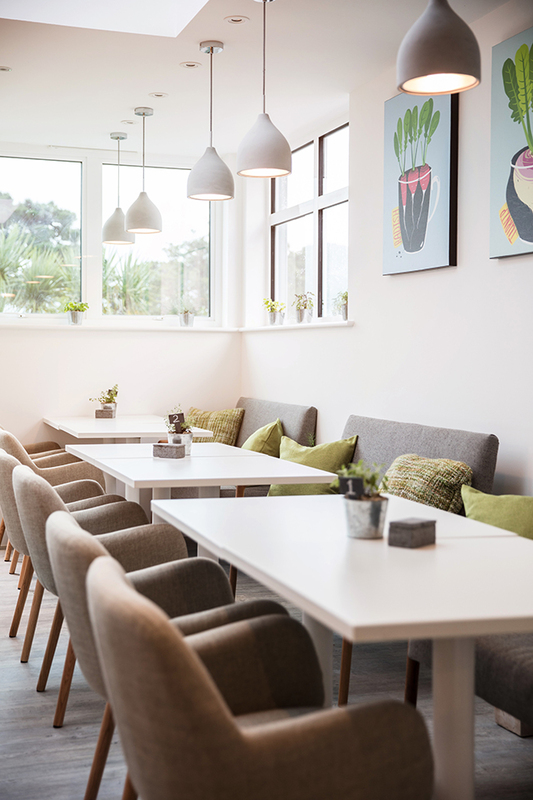 Under the watchful eye of the head of food and beverage, Polly Dent (ex Fifteen Cornwall), the new dining spaces are beautifully designed, with stylish menus to match. 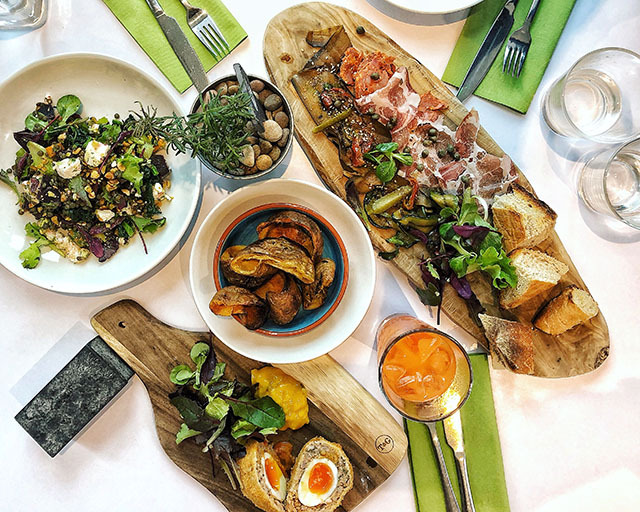 Polly kindly invited us to try out the Garden Kitchen‘s new lunch menu, and obviously we jumped at the chance, having heard such great things about it. 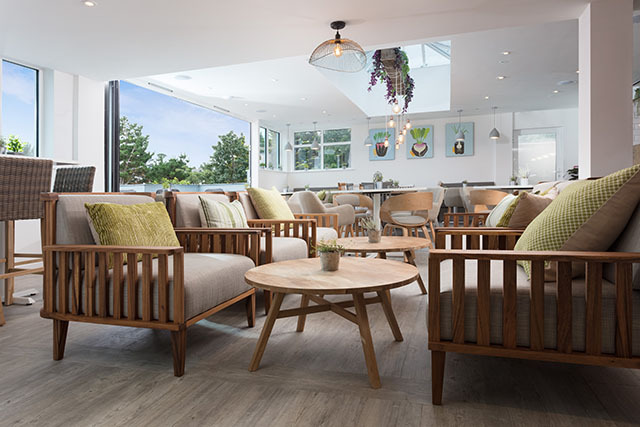 The Garden Kitchen restaurant is the more casual dining option at the hotel, and when we visited, it had a busy buzz about it. Fellow diners included men in suits having a business meeting, couples in dressing gowns enjoying a relaxing lunch as part of their spa day, and a group of friends celebrating a birthday. The space is light and airy, with contemporary yet comfy furniture, and plenty of plants adding to the “garden” feel. There are views over the trees to Gyllyngvase Beach, which is just a few minutes walk from the hotel’s front door. We decided to sample elements from different sections of the lunch menu. 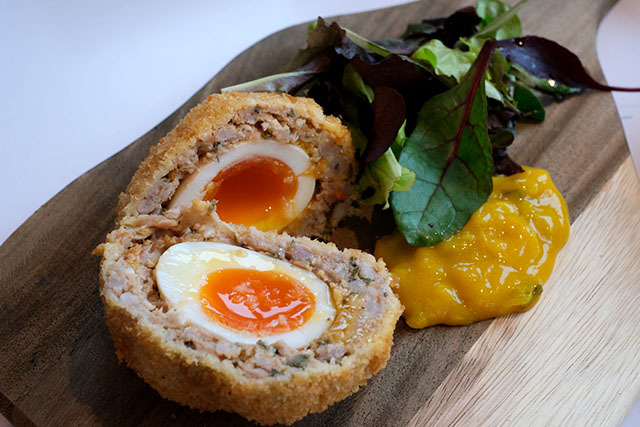 From the “quick lunch” options, which also include a slice of pie or quiche or bowl of soup, we chose the Scotch egg with piccalilli. With a perfectly runny yolk, lovely crispy coating, and zingy picalilli, the Scotch egg was a good choice. Ideal for a quick snack, or to share as a starter. There are several salads to choose from on the menu; cleverly they are almost all vegan, with options to add cheese or meat to some of them. 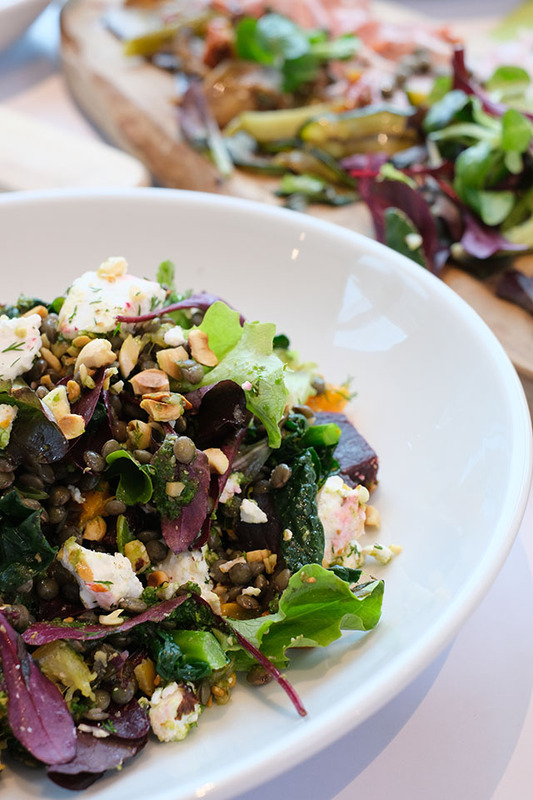 We went for the puy lentil salad, which was huge. As well as the lentils, the salad was packed with marinated beetroot, roasted butternut squash, a very garlicky (and delicious) kale pesto, toasted hazelnuts, salad leaves, plus the optional feta. The flavours and textures were wonderful, turning a healthy bowl of food into a real treat. 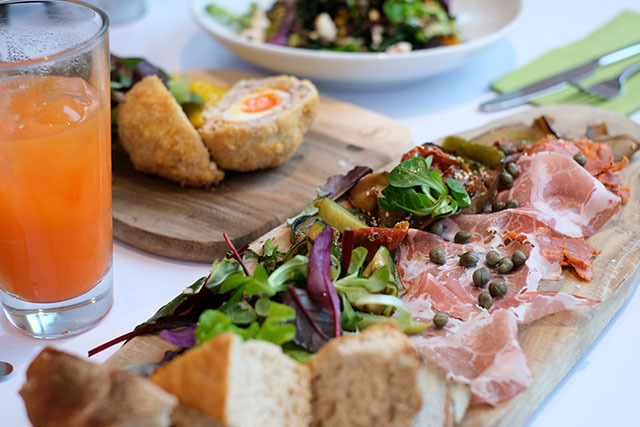 It was difficult to decide between the three sharing boards on the menu (charcuterie, garden meze, cheese board) so we opted for the “chef’s choice”, a combination of all three. 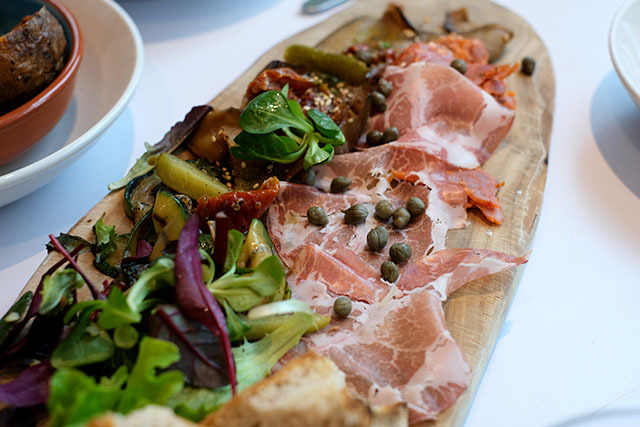 Our board was heaped with chunks of warm bread, salad leaves, roasted slices of aubergines and courgettes, sun dried tomatoes, chorizo, coppa, gherkins and capers. 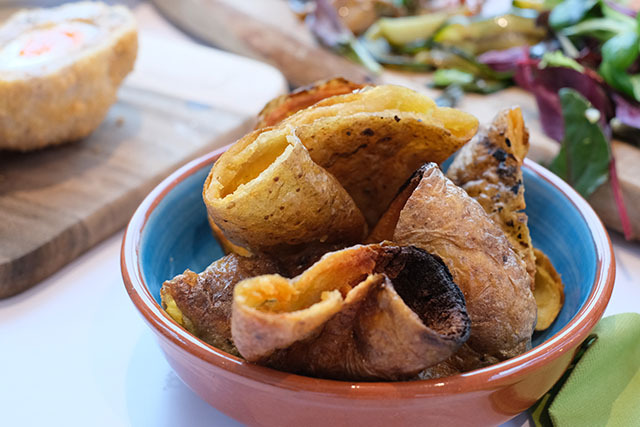 We couldn’t resist trying the potato skins, which were as delicious as they looked, crunchy and salty, and the perfect antidote to all the healthy dishes! For pud, there were cakes and other sweet treats available on the counter, as well as a selection of desserts on the menu. 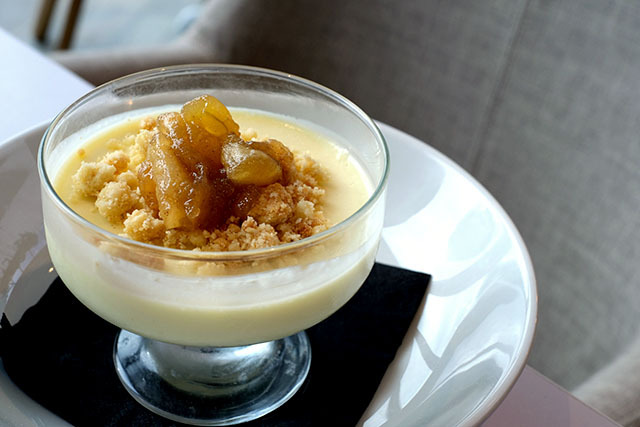 We shared the apple cheesecake, which was a deconstructed version of a cheesecake, with apple compote and crumble on top of the cheesecake filling. It was lighter than a usual cheesecake, more like a panna cotta, but very tasty nonetheless. The Garden Kitchen menu also features smoothies and juices (we tried the refreshing and vitamin-packed “Ginger Ninja”), brunch (available from 8am to 1pm), pizzas (from 12pm) and small plates (from 5pm). See here for the full menu. We thoroughly enjoyed our lunch, and wouldn’t hesitate to visit again. Following our quick tour of the hotel’s impressive facilities, next time I’ll combine lunch with a visit to the spa and its incredible hydrothermal pool and Cornish sea salt steam room, both of which looked fantastic. For more information about St Michaels, or to make a table or room reservation, visit www.stmichaelshotel.co.uk or phone 01326 369625. Disclaimer: We were guests of the hotel, and were very kindly treated to lunch for the purpose of this blog. Thank you to Polly’s team for looking after us so well. Photography credits: Interior shots provided by St Michaels Resort’s marketing deptartment. All food images by Barefoot.